ALL OUR JACK RUSSELL TERRIERS HAVE BEEN DNA PROFILED AND TESTED FOR PLL. All puppies are sold with copies of both parents DNA profile to prove they are clear by parentage. We are currently in the process of having all our dogs DNA profiled with a company in Europe. We hope to have results to post for all dogs in the next few months. We are testing for PLL, SCA, LOA. Most disese traits we are testing for have a basic mode of inheritence as above, autosomal recessive. What is Primary Lens Luxation (PLL)? The canine eye has the same general design as the human eye. 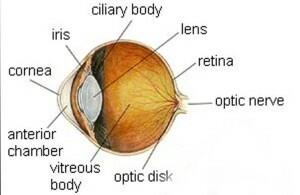 Light travels through the cornea, through the watery aqueous chamber, enters the pupil, traverses through the lens, then the vitreous chamber, and finally is absorbed by retinal receptors. The lens is held in place by a network of tiny fibers, called zonules, that attach the lens perimeter to the ciliary muscle that rings the eye—think of it as similar to a round trampoline, with the zonules the springs that attach the trampoline (lens) to the frame (ciliary muscle). If these springs were to break, the trampoline would fall from the frame. In some dogs, the springs break—or more accurately the zonules pull away from where they’re attached to the lens. If a few become detached, one edge of the lens floats around, but the lens is basically held in place. This condition is called subluxation. Signs of subluxation include a crescent shape visible through the pupil (actually the side of the lens) and a trembling iris, especially when the eye is moved. The eye may also be slightly reddened. Sometimes, administering prescription eye drops to constrict the pupil can help prevent a subluxated lens from getting worse and falling forward through the pupil. Eventually the increased tension placed on the remaining zonules, along with the genetic weakness, the lens will detach or luxate. The lens can then fall toward the front or the rear of the eye. Most often, it drifts forward (anterior luxation), where it may rub on the iris, poke through the pupil opening, and damage the inside surface of the cornea. This can cause pain and corneal swelling if not corrected quickly. It can also block the flow of aqueous fluid through the pupil and through the drainage angle. A posterior luxated lens can also block the drainage angle because of the vitreous that may be displaced forward. If the aqueous fluid is trapped, it builds up like water in a balloon, causing pressure and glaucoma. This pressure is not only painful, but potentially blinding. If the pressure isn’t alleviated within 72 hours, it will usually cause irreversible damage to the retina and optic nerve, resulting in permanent blindness. If less time has passed, and if the intraocular pressure isn’t severe, the retina and optic nerve still look healthy, there’s a fairly good chance of retaining vision by surgically removing the entire lens. Removing the lens leaves the eye severely far-sighted, but it may be possible to replace it with an artificial lens, restoring vision to a fairly normal focus. When lens luxation isn’t secondary to another cause, it’s known as primary lens luxation (PLL) and is hereditary. Pedigree studies show it is consistent with a recessive mode of inheritance and lens luxation has been reported in at least 45 dog breeds. Most often cases of luxation occurs between four and eight years of age (although about 10% of cases occur after age 8). In hereditary cases once the lens in one eye has luxated, the lens of the other eye will usually do so within months. An ophthalmologist may detect early signs, such as a wobble to the lens as the eye moves, indicating that the zonular ligaments are loosening. In such cases, it’s usually best to remove the loose lens before it luxates, avoiding a crisis requiring emergency surgery. Because of the late age of onset and the fact that carriers usually exhibit no signs, breeders have long waited for a way to identify the gene or genes that cause PLL. Normal dogs (with two copies of the normal gene) are at negligible risk. Carriers (with one normal and one mutant gene) have a slight risk of developing PLL, while less than 2% of Jack Russell’s testing as carriers have luxated, these are thought to be secondary to other factors, trauma and environmental. Genetically affected dogs (with two copies of the mutant gene) are at high risk of developing PLL at some time in their life. In the past, breeders were advised to remove affected and carrier dogs from the breeding population. In practice, this wasn’t always possible as many affected dogs were bred before their condition became known. The DNA tests changes that. Wise use of this test will allow breeders to avoid producing lens luxation ever again. We will now be able to test for this painful disease and know the results within weeks of submitting the test. Carriers can be bred, and on the rare occasion an affected, as long as they are bred only to normals and the resulting litters are tested. Breeders should continue to breed with their carriers for a few generations at least, to avoid severely reducing the genetic diversity of our breed, but with sensible use of the test we can look forward to a future without PLL. Teams of researchers led by Dr. Gary Johnson and Dr. Elizabeth Giuliano at the University of Missouri found the chromosomal location of the mutation causing PLL in Jack Russell Terriers. They were able to further pinpoint the exact region on the chromosome until they identified the mutation involved. Working independently of one another, and studying different breeds, English researchers, Dr. David Sargan and Dr. Cathyrn Mellersch, identified the same location associated with Lancashire Heelers and Miniature Bull Terriers. The term cerebellum in Latin means “the little brain”. The cerebellum is the part of the brain responsible for coordinating movements. Ataxia comes from a Greek term meaning “without order”. When the cerebellum cannot coordinate movement, the dog can move, but the movement is poorly coordinated. They are not weak, in fact, often the movements a dog with ataxia makes are too strong. They have a goose-stepping gait and when excited or running, their legs may appear to be going every which-way. Sometimes they have problems with their balance and will fall frequently. In order for the cerebellum to control movement, it needs to get feedback about what the muscles are doing. This feedback comes to the brain through the spinal cord. When there are changes in the spinal cord in a dog with cerebellar ataxia, the disease is often call spino-cerebellar ataxia (SCA). The Late Onset Ataxia (LOA) in the Russell Terriers is a genetic disease characterized by lack of balance and incoordination of gait. The visual symptoms are usually noticed between 6 months and 12 months of age. The first symptoms are stiffness of hind limbs, difficulty going up the stairs and incoordination when jumping. The disease is progressive and the condition of the affected dogs is getting worse and the typical signs include stiff jumping and "dancing" in place. In the worst stage of the disease, the dogs often fall down and have trouble getting up and walking. The disease is progressive and after the onset of the first signs the problems with balance and gait incoordination are increasing rapidly. In some cases, possible stabilisation of the condition was described, but in the most cases the progression of the disease is unbearable and the affected dogs are often prematurely euthanized. The neurological examination of the affected dogs shows symmetric spino-cerebellar ataxia - cerebellar malfunction characterized by inability to carry out precise and quick movements of skeletal muscles. So far there have been described the neonatal cerebellar ataxia in Coton de Tulear dogs (GRM1 gene), cerebellar ataxia in Finnish Hounds (SEL1L gene) and cerebellar abiotrophy in Beagles (SPTBN2 gene). The mutation responsible for the Late Onset Ataxia in Russel Terriers was found and described in 2013 (Forman at al, 2013). The mutation causes a substitution c. 344G>A in CAPN1 gene leading to cytosine replacement by tyrosine (C155Y). In Parson Russell Terriers and Jack Russell Terriers, another type of spino-cerebellar ataxia caused by a mutation in KCNJ10-gene was described. The tests for this type of mutation are not performed by Genomia laboratory.